This Simply Chocolate exclusive gift brings back memories of every child's favorite chocolate bars but with a Grown Up taste. Classic chocolate bar lovers will love this original and delicious gift. 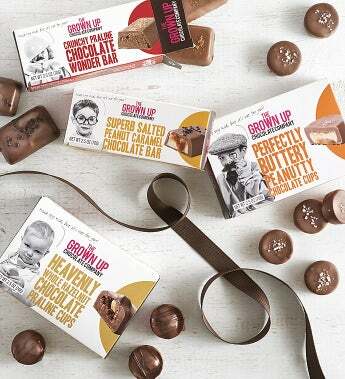 These premium bars and cups are handmade with love in England using the very best ingredients. Arrives in a textured kraft gift box with ribbon and gift tag. Go ahead - indulge! Crunchy Praline Chocolate wonder Bar - 2 bars of carmelized wafer enticingly slathered in sumptuous praline encased in real milk chocolate, a true wonder bar!